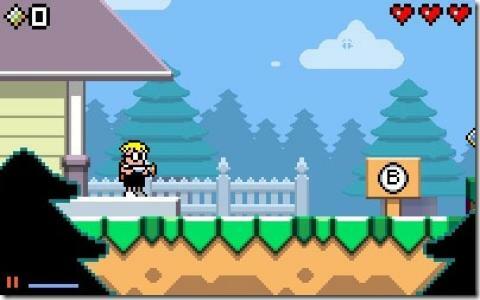 It has to be said, but Mutant Mudds is a bit on the depressing side. It's one of those modern games that thinks it's all cool and retro but which sadly fails to realize that it takes more than just some chunky old-school graphics and simple gameplay to replicate that true retro feel. It's not a bad game per se, but it's far from being a proper retro platformer like Dangerous Dave or Rick Dangerous and lacks any real long-term appeal. You're in control of Max, some kind of nerdy kid, and must venture through an extensive series of side scrolling platform levels, set across five worlds and eight different visual styles. Your main goal is to simply complete each level, and there are three ways of doing this. You can simply make it to the end, Sonic style, collect all the diamonds or find the secret stage and complete it. 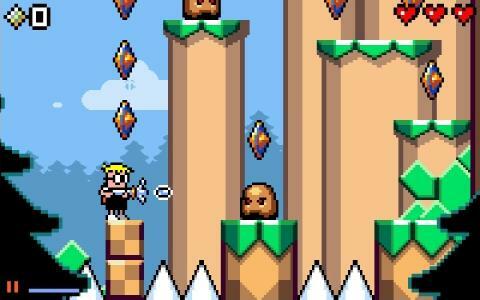 The gameplay is a mix of run 'n' gun and platforming, and you can collect things like bazookas and jet packs to help you navigate things, while you can also control Max's grandma for an extra challenge. As far as modern retro games go, this is certainly fun stuff. The visuals do a decent job of recreating the old days, with some nice chunky level and character design, and good use of color. The levels are generally well designed, being both fun and challenging to complete, while sound design is as chirpy as the visuals, with some groovy chiptunes to get down to. The controls are tight and responsive, so if you are looking for a modern take on the classic platformer, this is a good bet, but proper old-schoolers are best off sticking with the real deal.